For those of you who are wondering why I call myself the Lazy Cook. Just because I enjoy eating and cooking doesn't mean I want to live in my kitchen. I take shortcuts whenever possible. Who cares if you spent 6 hours slaving away or 6 minutes as long as it tastes good. Right? I normally entertain a friend and her kids on Fridays. While the 3 kids run amok at my place, the moms sit down and catch up over a leisure dinner. 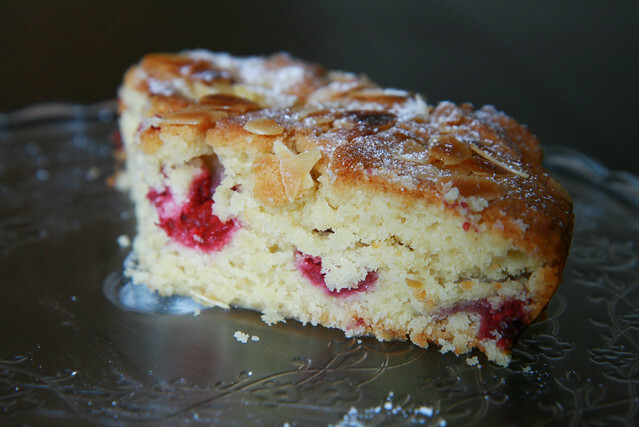 However, I ran out of time last Friday due to a hectic schedule and decided to bake a simple Raspberry Bakewell cake for dessert instead. It's foolproof and requires little work. You chuck all the ingredients into a processor and blitz. If you're like me and do not own a processor, use a normal mixer. By the time I managed to take a photo of it, more than half the cake had disappeared. Since I've had such rave reviews, I decided to share the recipe here too. Normally, I find myself having to reduce the amount of sugar but in this case, I didn't have to. 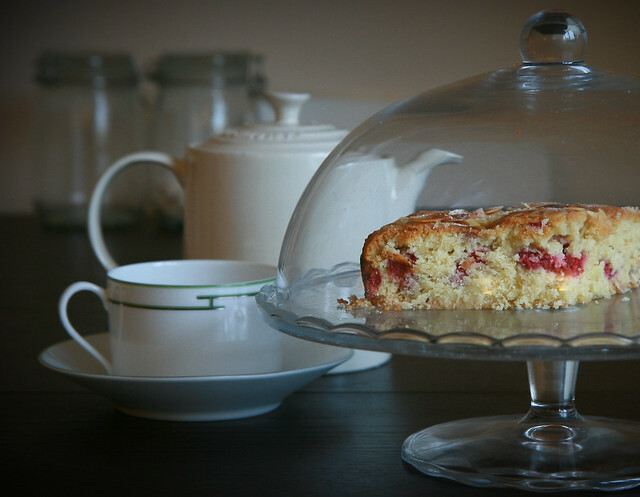 The cake has just the right amount of sweetness juxtaposed with the tart raspberries. The ground almond keeps the cake moist and fresh for 3 to 4 days. So if you want to impress your friends with your amazing baking skills and let them think you've spent hours making a cake, try this recipe. Trust me, you'll definitely get a "wow, I can't believe you baked this" response. Spread half the mix over the cake tin and smooth over the top. Scatter the raspberries over, then dollop the remaining cake mixture on top and roughly spread - you might find this easier to do with your fingers. 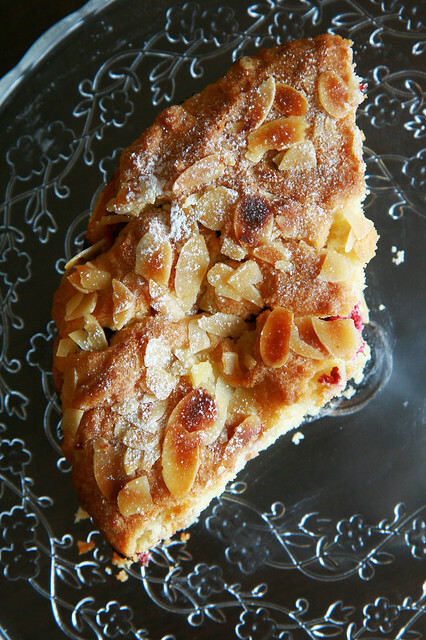 Scatter with flaked almonds and bake for 50 mins until golden. Cool, remove from the tin and dust with icing sugar to serve. I love your recipes! Just simple enough but they all look delicious. And yes I echo the comment above - you need to write a book! This looks really good! I am going to try to convert this into the US Customary measurements and try this out! That looks picture perfect, it would go perfectly with my coffee and cream right now. I love a good, lazy recipe and am always looking for fool-proof desserts. What can I say??? I am a bargain shopper :) I know I know...it's my god gifted talent on top of the fact that I can also out-eat all of my friends and still be the slimmest one :D Do u h8 me now?? lol! Oh I can't wait to make this! I don't have much of a sweet tooth, but THIS looks so yummy. This looks delicious! I'll have to convert the measurments and try it ASAP!